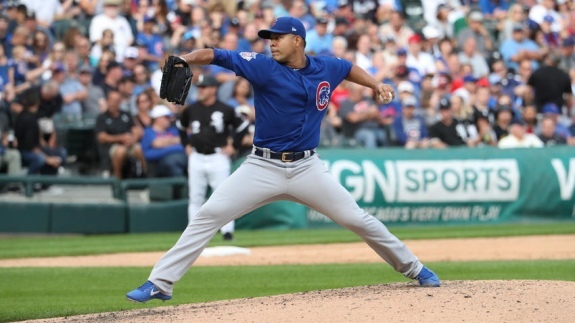 Chicago Cubs pitcher Jose Quintana made his first start against his former team, the Chicago White Sox, on Friday. He pitched five innings and allowed five runs in a losing effort. This evening, I'm catching my final game of the 2018 regular season. This year, my birthday weekend synced with a three-game series between the Chicago Cubs (89-64, .582) and the Chicago White Sox (61-92, .399) at Guaranteed Rate Field. Yesterday's final score, 10-4, gave the impression that the score was much closer than it truly was. While the Cubs grabbed a 1-0 lead when Daniel Murphy launched a solo home run to lead off the game, the North Siders did not score their final three runs until the eighth inning. The White Sox had a commanding 10-1 lead at the time. Games like that happen throughout the regular season, however, the first-place Cubs still lost by six runs to a team that is currently 31 games south of the .500 mark. But this season, the Cubs are cutting it close. Barring a total disaster similar to the 1964 Philadelphia Phillies, the Cubs will earn a spot in the postseason. The Cubs currently sit atop the National League Central and have the best record in the Senior Circuit, but the Milwaukee Brewers (88-66, .571) are only 1 1/2 games back. While the Cubs' magic number is eight, only nine games remain on the schedule. Even if the Brewers catch them and steal the division title, they should secure one of the two National League wild card slots. The Phillies did not have that luxury 54 years ago. Tonight, the Cubs will start 34-year-old Jon Lester (16-6, 3.43 ERA). During his last three starts, he picked up wins against the Phillies (78-75, .510) and Cincinnati Reds (66-89, .426) and lost to the Brewers. He pitched 18 2/3 innings in those three starts and allowed just three earned runs. The White Sox will answer by sending 24-year-old Lucas Giolito (10-11, 5.77 ERA) to the mound. Giolito was 0-2 during his last three starts against the Detroit Tigers (62-92, .403), Kansas City Royals (53-101, .344) and Baltimore Orioles (44-109, .288). The Tigers roughed him up on September 4. He allowed four earned runs in 1 1/3 innings. Looking toward the postseason, only three teams have clinched spots. The Cleveland Indians (85-68, .556) and Boston Red Sox (105-49, .682) have locked up the American League Central and East Division titles respectively. Last night, the Houston Astros (96-57, .627) have clinched at least an American League wild card spot. No National League teams have secured playoff spots, but with a win today, the Atlanta Braves (86-68, .558) will clinch the National League East. Currently, the Braves are beating the Phillies 4-0 in the top of the fifth inning. It's early, but Braves starter, Mike Foltynewicz has not allowed a hit. Fun Fact: Since interleague play started during the 1997 season, I have seen the Cubs and White Sox play five times. In those five games, the Cubs have won three and lost two. The first time was the inaugural game on June 16, 1997, and the most recent was on July 11, 2015.